Lake O’Hara and Odaray Mountain from the Alpine Circuit, one of the outstanding hikes for those lucky enough to visit Lake O’Hara in Yoho National Park. Brian Patton photo. This description on the Lake O’Hara Lodge website is certainly no exaggeration. Lake O’Hara’s scenic reputation and outstanding trail system has been drawing hikers for decades. In the 1970s, a quota system was introduced for bus access to the lake, one based on accommodation at the lodge, the Alpine Club of Canada’s Elizabeth Parker and Abbot Pass Huts, and the Lake O’Hara Campground, plus a limited number of day users. As the years passed, the reputation and popularity of the area ballooned thanks to the media and internet. Today, getting to O’Hara has become a rather desperate crapshoot. Reservations for 1,000 day use tickets for this summer opened at 8 am on April 20. Fifteen seconds after the hour, all the tickets were gone, and 16,000 other folks came up empty-handed. “The average person, they don’t have a chance to get in,” says Calgary Outdoor Club vice-president Lorrie Wazny in a CBC report Lake O’Hara remains a ‘paradise’ inaccessible to thousands. The CBC story and video provides a sobering overview of how far people will go for a chance to visit Lake O’Hara. But there are other options. You can gain access to Lake O’Hara if you’re booked into the Alpine Club of Canada’s Elizabeth Parker Hut in the Alpine Meadow, located 0.6 km from the access road and lake. Unfortunately, there are only 24 beds available and overnight rates are quite reasonable ($30 to $40). As a result, the Alpine Club has introduced a lottery system. 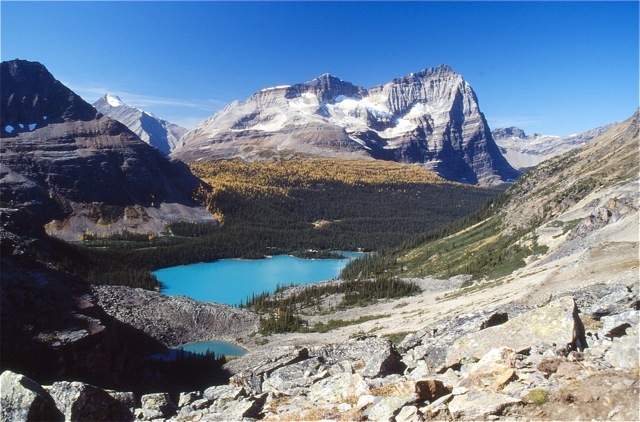 Many O’Hara visitors stay at the 30-site Lake O’Hara Campground, located just off the access road 0.6 km north of the lake. Only one small tent is allowed per site, and only two sites can be occupied by a single group (no more than 6 people). As of this posting, all sites in the campground are booked from June 22 to August 11. And as of 10 am tomorrow morning, August 12 will likely be filled as well. Good luck! Yes, it is rather expensive, but it is one of the classic backcountry lodges in North America. Great meals and cozy accommodation in the lodge or one of the lakeside cabins. The lodge is welcoming guests from June 19 to October 3 this year, but it too is sold out. You can check out availability for 2019 by calling the lodge’s off-season line 403-678-4110 (Mon, Tues, Weds, Thurs) after October 3. A growing number of people are choosing to walk the 11-km access road to the lake (bicycles not permitted). Many of them are gambling that they can complete one of O’Hara’s classic hikes at the end of their mundane approach then catch the last bus back in the evening to the parking lot (at present there’s no restriction on riding the bus down except for a one-way fee). The only problem, so many hikers are using this tactic, there’s not enough room on the last bus of the day. And since the bus won’t return for the overflow, the stragglers face another 11 kms in the gathering darkness. Based on one-way bus fares down from the lake, it is estimated that 3700 people hiked the road to the lake. And if you count the ones who hiked back down as well, that estimate is likely at least 4000. The Lake O’Hara Trails Club and the Lodge both realize that Parks Canada’s quota is being exceeded thanks to uncontrolled pedestrian access, and there is a suggestion that the one-way ticket down from the lake be eliminated to help control this. But if all this sounds rather depressing, you do have one other option. There is a very good chance of getting one of 24 beds at the Alpine Club’s Abbot Pass Hut, the second highest structure in Canada at 2926m (9,600ft). And since Lake O’Hara is the best starting point for trips to the hut, your reservation qualifies you to ride the bus to the lake. Only one problem, once you get to Lake O’Hara, you have a 3 to 4 hour climb (915m/3,000ft) up very steep, treacherous scree (sometimes snow) slopes to reach the hut. This hike is ONLY for strong, experienced scramblers. The hut’s main purpose is as a shelter for climbers bound for Mounts Victoria and Lefroy, but strong hikers also make the journey to overnight there. And on the way back down, they often add Lake Oesa, Yukness Ledge, and Opabin Plateau to their itinerary. See the Alpine Club of Canada’s Abbot Pass Hut page. Unfortunately, the hut is increasingly occupied by hikers, leaving serious mountaineers literally out in the cold. And then there are individuals who book the hut and pay the ACC’s fees simply as a day-pass to reach the lake, leaving an empty bed at Abbot Pass. It is a growing problem for the Alpine Club. 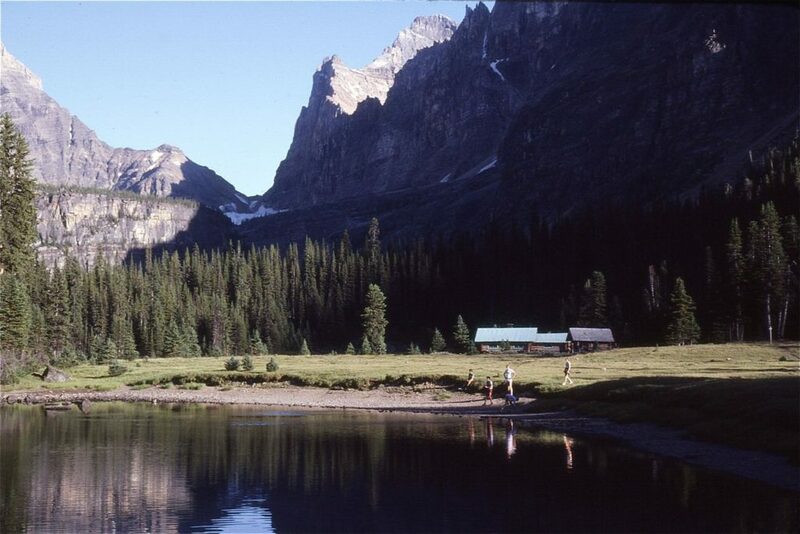 A quiet evening in the Alpine Meadow for a family staying at the Elizabeth Parker Hut in 1984. Brian Patton photo. All of this triggers memories of our first visit to Lake O’Hara. We camped near a picnic shelter in the Alpine Meadow, a stone’s throw from the Elizabeth Parker Hut. Needless to say, the meadows didn’t fare well, particularly during rainy summers. In the autumn, after the last shuttle bus of the season, you could pick up a key to the access road gate at park headquarters in Field and drive to the lake (I took my parents there for their only visit). I’ve day-tripped to the lake several times using the shuttle bus (once we missed the last bus and hiked out, which I remember as not all that unpleasant). In winter, I’ve day-tripped to the lake on skis. On another ski trip, we overnighted at the Elizabeth Parker Hut and had the place to ourselves. I even spent a couple nights at the lodge in mid-September many years ago (a birthday present). And thanks to a friend who managed a mid-September bus reservation by calling the booking line in mid-June, I had the best photographic day of my life on All Soul’s Prospect and the Opabin Plateau. Both are glorious memories since both were at the peak of the autumn alpine larch season and the weather was perfect. I’m not trying to make anyone feel bad. That’s just the way things were way-back-when and how they are today. Wiwaxy, Oesa, Yukness, Opabin, All Soul’s, McArthur, Odaray, Cathedral—magical objectives in a hiker’s paradise. If you can win one of the access-to-O’Hara lotteries, regardless of the weather, your trip will be worth it. What a nice site with outstanding information. Your gorgeous pictures make one want to lace up their Hiking Boots, just like the mountains and Crystal Clear Oak Creek where I come from in Sedona, Az. I look forward to your future adventures!